[SatNews] All is currently proceeding on schedule, and the SIRIUS XM Radio audience should be pleased. Currently scheduled to launch on October 14-15 (depending on your Earthly location time zone) from the Baikonur Cosmodrome. 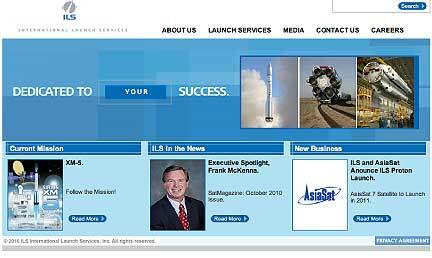 The ILS Proton Breeze M is slated to launch their client's, SIRIUS XM Radio, New York, New York, the XM-5 satellite. The XM-5 is a high-power geostationary satellite from SIRIUS XM Radio, America’s satellite radio company and the major player in audio entertainment. XM-5 is intended to serve as an in-orbit spare for the existing fleet of SIRIUS and XM satellites, and ensures SIRIUS XM’s array of audio and data services are reliably delivered to subscribers. XM-5 will help with the delivery of more than 130 channels of commercial-free music, premier sports, news, talk, entertainment, traffic and weather to close to 20 million subscribers, as well as services such as XM NavTraffic®, which provides real-time traffic information to vehicles in markets across North America. SIRIUS XM has arrangements with every major automaker and its radio products are available for sale at retail locations nationwide. The mission's plan proceeds in the following manner: The Proton M launch vehicle, utilizing a 5-burn Breeze M mission design, will lift off from Pad 24 at Baikonur Cosmodrome, Kazakhstan, with the XM-5 satellite on board. The first three stages of the Proton will use a standard ascent profile to place the orbital unit (Breeze M upper stage and the XM-5 satellite) into a sub-orbital trajectory. From this point in the mission, the Breeze M will perform planned mission maneuvers to advance the orbital unit to a circular parking orbit, then to an intermediate orbit, followed by a transfer orbit, and finally to a geosynchronous transfer orbit. 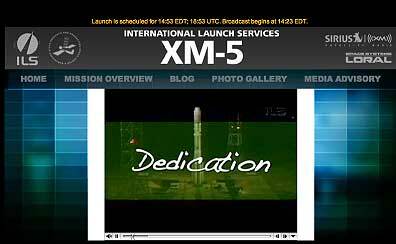 Separation of the XM-5 satellite is scheduled to occur approximately 9 hours, 12 minutes after liftoff. You are invited to review a live webcast at, which will begin approximately 30 minutes before liftoff. The direct link to the webcast is.